In 1944 George Grod, a strip cartoon, modeling and aviation enthusiast, discovered with amazement some American magazines which an MP billeted near his village lent him. What he liked best were the gleaming advertisements scattered throughout the pages. Unfortunately, due to sales rights restrictions, we cannot offer When Art Kept 'Em Flying for sale in your country. 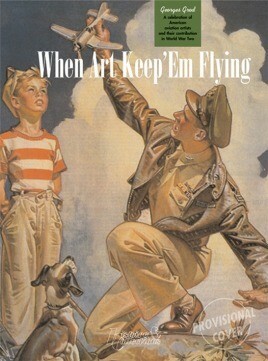 • American WWII Aviation seen through advertising. In the eighties, during an “old papers” fair, George came across some old numbers of Life Magazine and from there he started an unbridled search for original magazines dating back to between 1942 and 1945. Now presented in this single volume, we see the return of all his great themes - aviation, kits, cartoon strips, the love of art and even the cinema. The book is not just a collection of beautiful pictures all strung together or a sample from a huge collection; it is above all the testimonial of a period, the reflection of that immense war effort the American people made during the last World War, seen through the kaleidoscope of publicity and propoganda. It is also a tribute to the most glamorous of our liberators. George Grod worked alongside great film-makers like Verneuil, Minnelli, Zinnemann, Lumet and Zanuck before working on the television series les Dossiers Noirs with his friend Jean-Michel Charlier who took part later in the Grands Maïtres de la BD (Grand Masters of the Cartoon Strip) which he created for the Visiteurs de Mercredi (Wednesday’s visitors). This book is a must for anyone interested in art, history or World War II; an impressive edition to anyone’s collection. …a bit of colorful time travel…an excellent book with hundreds of interesting illustrations.